Breakout alert! 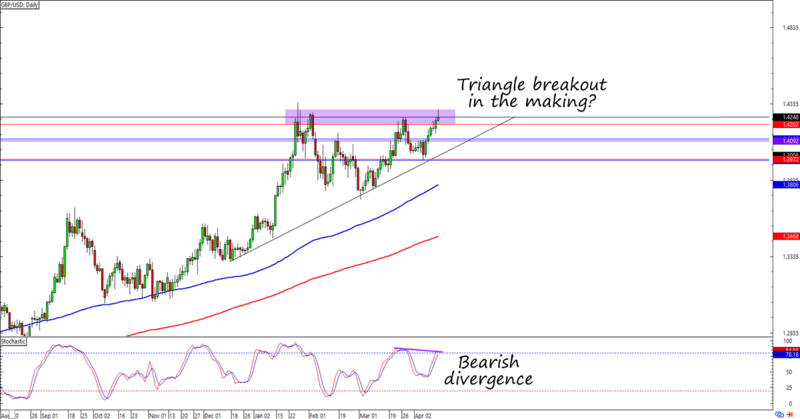 GBP/USD looks like it’s about to break a triangle setup on the daily. What do you think of this forex setup? On this week’s chart, I’m looking at a possible upside breakout for Cable. See, the pair is now testing the 1.4250 mark, which lines up perfectly with an ascending triangle resistance on the daily. What’s more, there’s a bearish divergence poppin’ up on the chart! If you’ve seen my last couple of trades, then you’ll know that I’ve been long on the pound for a while now. Not only that, but I also have a long-term short bias on the dollar. U.S.-China trade war concerns might have stepped back a bit after Xi Jinping’s speech earlier this week, but it seems like traders are withholding their verdict until they see either a concrete trade deal or a trade war. Meanwhile, geopolitical tensions are pointing to increased possibilities of another world war. Syria saw another chemical attack earlier today, which Russian officials have shrugged off as “staged.” If Trump decides to make missiles rain anyway, then we might see more gloom and doom for the dollar and dollar-denominated assets. Over the next couple of days I’ll pay close attention to this resistance level. If the pair breaks higher, then I might enter above January’s highs and trail my stop. But if the resistance holds, then I’ll find a better entry around the 1.4000 – 1.4100 areas.